It is strange that a man who played 176 games for Arsenal and got an FA Cup winners medal for the win against Manchester United in which Alan Sunderland scored in the last minute, is somehow not quite remembered. I’ve been working on the forthcoming book “Arsenal in the 70s” these past few months, and as I get to the end of the decade, David Price’s name is there much more than I remember him being there. Indeed he was a very important member of the side. Yes I recall him playing, but he never really seemed to become an absolute essential part of the team. Indeed I was amazed to see just how many games he played. So is this my memory once more playing tricks? Probably, but maybe there is a little more. My own guess (nothing more) is that having been a superb player in his youth (captain of England schoolboys, then a member of the famous FA Youth Cup winning side in the Treble Year (normally mis-quoted the Double Year – 1971 – forgetting that we won the FA Youth Cup too), maybe too much was expected. But we must not forget that he suffered injuries after he left Arsenal and retired from the game early. Everyone thought he would continue on and be a brilliant player. But having risen so quickly, his talent seemed to fade and he drifted away. Could injury have done that? He was born 23 June 1955 in Surrey, and joined Arsenal in 1970 and made his first team début aged 17 in the end-of-season game against Leeds on 9 May 1973. He hit the big time playing 51 times in 1977/8, and was part of squad that played three cup finals in a row – and was involved in the Talbot goal against Man U. He also played in the Cup Winners Cup final against Valencia.And then at the start of the 1908/1 season he was replaced by John Hollins and at the end of that season sold to Crystal Palace in part exchange for Peter Nicholas.Perhaps part of the explanation is that he then got injured at lot and perhaps the reason he left Arsenal was that during his final season with us he did indeed start suffering from injury, and there was a fear it was reducing his ability. If you know please do tell, so we can complete the story. He moved on to Orient after Palace, and then stopped playing aged 28. Wiki says that he is now a taxi driver in Croydon, which I suppose leads to the inevitable comment, “Ere – I had that David Price in the front of the cab the other day…” (Sorry that’s not really understandable if you don’t get London humour).But let’s not be too negative. He was part of that Cup Team at the end of the 70s, and achieved far more than most of us will even dream about in footballing terms. i forgot we swapped him for Nicholas. Price was way better than that tosh from Palace. Great article. Any news on the release date of the book? I’d like Price. Forgot he was exchanged for that useless welsh captain. I really can’t stand Peter Nicholas. Any idea on the book release? David was agreat player, but suffered in the same way as Aaron Ramsey is today. He was a player you either loved or hated. but his contribution to the 70’s team was always 100%. I always wondered what happened to David, so thanks for this article. One question though, why is he not remembered at the Emirates in one form or another? Hi there, You’re right in saying that he was not quite remembered. I saw him play many times and he was definitely one of the unsung heroes. Just to let you know that the last time I saw him was when I played against him in a Southern Amateur League game in the late 80’s. He was playing for West Wickham and looked exactly the same apart from a bit of middle age spread. He still had all the skill and reading of the game. Maybe if we hadn’t bought Brian Talbot we would have heard a lot more of him. Used to see David Price every morning when I used to use Arsenal underground to go to school. Don’t remember him much as a player but always noticed what a real gent he was. Always polite and mild mannered, and very humble. Wish him well whatever he’s doing today. David is a taxi driver in Croydon— I got in his cab a few years back. Hi I remember David Price very well & he was always a hard working pro t the credit h deserved a little like dare I sy David ays decade laer! David Price worked for my Father (of Purley Cars Ltd) for many years until the company closed. I knew him well and often saw him when I helped dad out of an evening or weekend. He was an absolute joy to be around….a very funny and genuine chap. We lost touch some years back and I sincerely hope he is happy and well. Chelseachick, please send him my regards! He worked for Station Cars in Purley not Purley Cars. David at the game yesterday what a lovely and Happy man!!! David Price, good player, he was at my wedding, or rather the reception was at West Lodge, Cockfosters and the Arsenal team were lunching there, he must have been late and had to break through our ranks as the photos were being taken! that right middle position was a problem position. Geordie Armstrong (when he played both wings at the same time) was best, the double team didn’t really have a right middle player, Storey/Kelly and Charlie George/Jon Sammels played in the middle, Pat Rice played up n down the right. Alan Ball didn’t really work, he wanted to play in the middle, Trevor Ross, The Yugoslav bloke was tried, and then Alan Sunderland came in, only to move up front when Malcolm McDonald go injured. All the 70’s players were lefties, George Graham, Brady, Rix …. No matter David Price, good player. I remember David Price as an Arsenal apprentice in the early 70s.He lived and boarded with Mrs Rowe in Boundary Rd Wood Green with another Arsenal apprentice Barrie Vassallo from Newport Wales.They use to have to be in by 10pm on a fri as the club use to ring to make sure they were home.I lived near and my friend and i use to speak to them frequently. I am not sure if David will remember me . we played together for Croydon District for 4 years ..He was my captain..We all knew then that he would make it he was special. We forget that to get to a team like Arsenal you need to have played at a good level and trained by good coaches. I lost touch with his progress after i left England. I was sadden by his injury problems and the fact he was not really recognized in my opinion for what he did for Arsenal, players like myself who knew him and played with him before he went professional know he was a gentleman and so was his father. Really glad I got to send him this message. I spoke to David on Saturday 28 April 2018 at Wetherspoons in Purley, after Palace’s 5-0 win over Leicester. He recalled playing with Vince Hilaire in Palace’s ‘team of the 80’s’ but obviously remains an Arsenal man through and through. Very nice bloke and pleased to see that he is remembered well by Arsenal fans through this article and replies. Hey that is great Mr O. 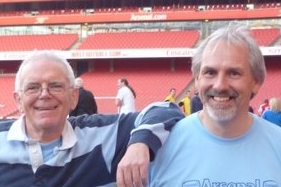 If you do speak to him again, please do give him our regards and tell him if he ever fancies doing a telephone interview with or writing an article for the Arsenal History Society, we’d love to carry it. I meet David and his friends on vacation in 1975. We lost touch over the years. I have tried a couple of times to get in touch with him but no luck.im a big Arsenal fan since then plus Freddie Ljungberg is from my home town.If you could give David my E-Mail address I be very thankful. My favourite player as a kid, simply because I had hair like his LOL. Always remember him for his excellent cut back for the first goal in the 79 cup final.